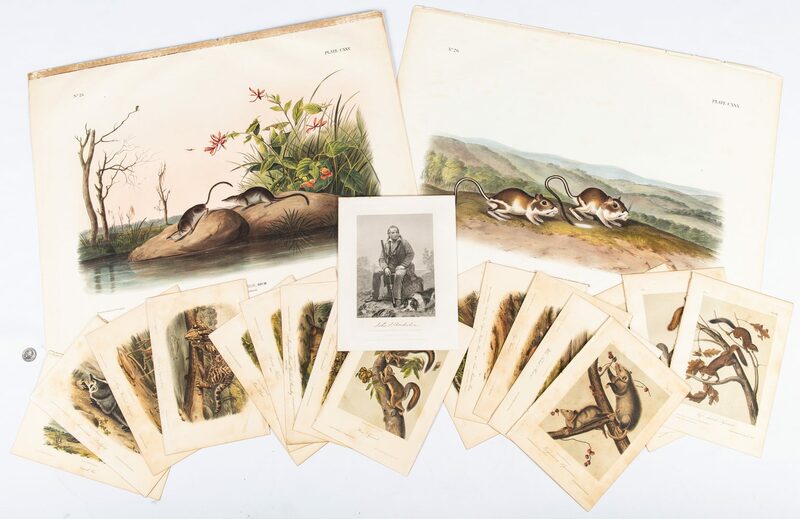 Twenty-one (21) John James Audubon (American, 1785-1851) and John Woodhouse Audubon (American, 1812-1862) prints, including "The Viviparous Quadrupeds Of North America". 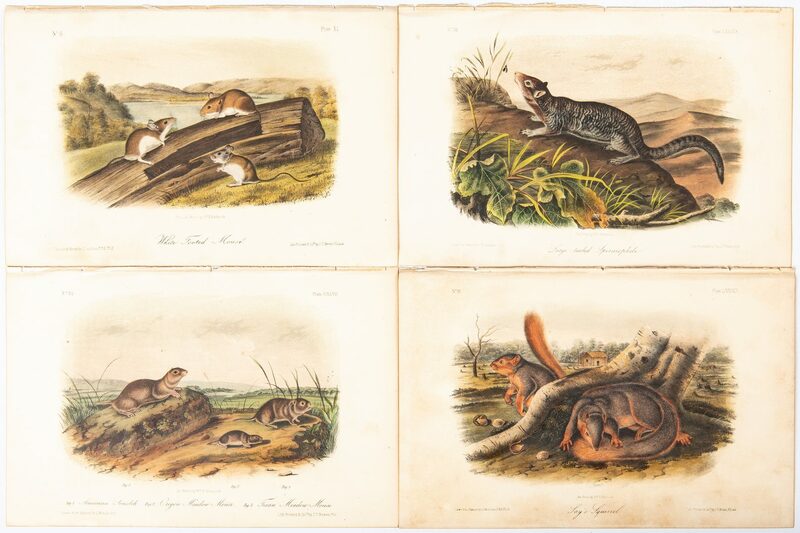 1st-2nd items: Two (2) hand-colored lithographs from the Bowen Imperial Folio Edition of "The Viviparous Quadrupeds Of North America", first printed edition, 1845-1848. Lithographed, printed, and colored by J. T. Bowen, Philadelphia. Prints include "No. 25, Pl. 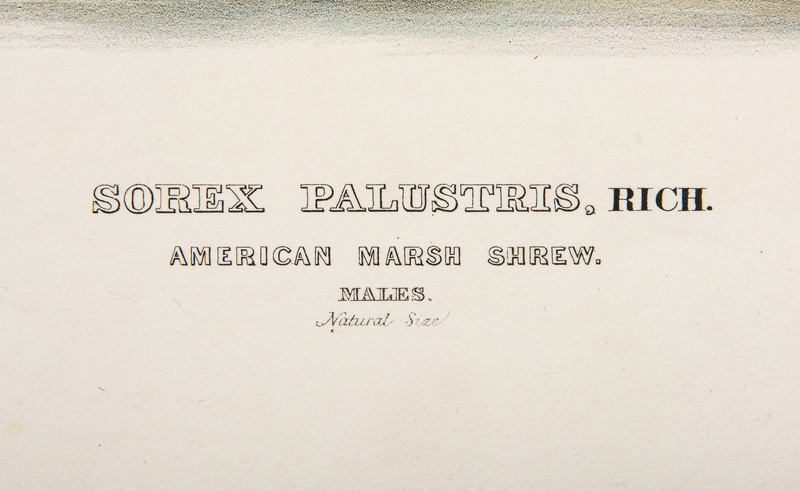 CXXV, Sorex Palustris, Rich" and "No. 26, Pl. 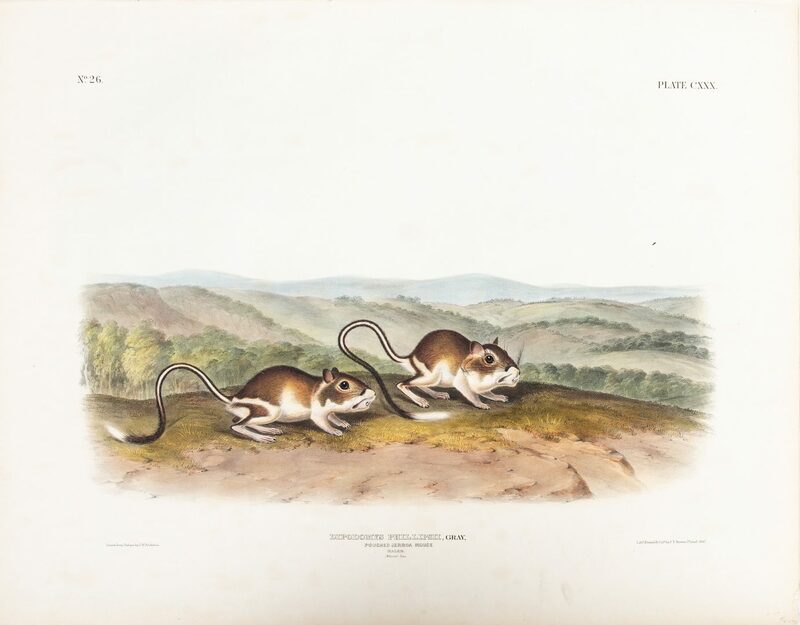 CXXX, Dipodomys Phillipsii, Gray". 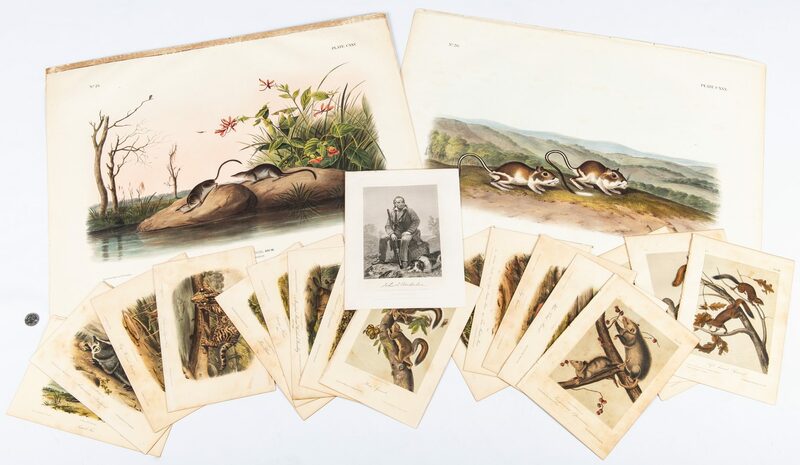 Prints approximately 21 3/4" H x 27" W. 3rd-20th items: Seventeen (17) hand colored lithograph prints from the Royal Octavo edition of "The Viviparous Quadrupeds Of North America", etched on stone by William E. Hancock or R. Trembly, fifteen (15) lithographed, printed, and colored by J. T. Bowen, Philadelphia, two (2) colored by J. Lawrence, printed by Naegel and Weingaertner, New York, first printed edition, 1849-1854. Prints include "No. 1, Pl. II, Maryland Marmot. Woodchuck. Groundhog", "No. 3, Pl. XV, Oregon Flying Squirrel", "No. 4, Pl. 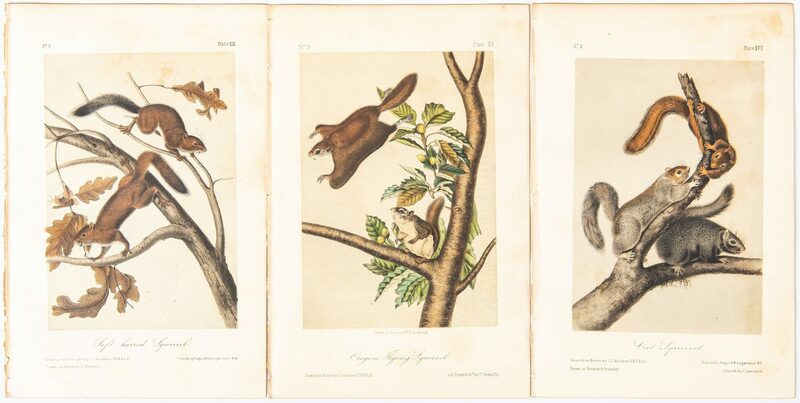 XVII, Cat Squirrel", "No. 4, Pl. XIX, Soft haired Squirrel", "No. 7, Pl. XXXII, Polar Hare", "No. 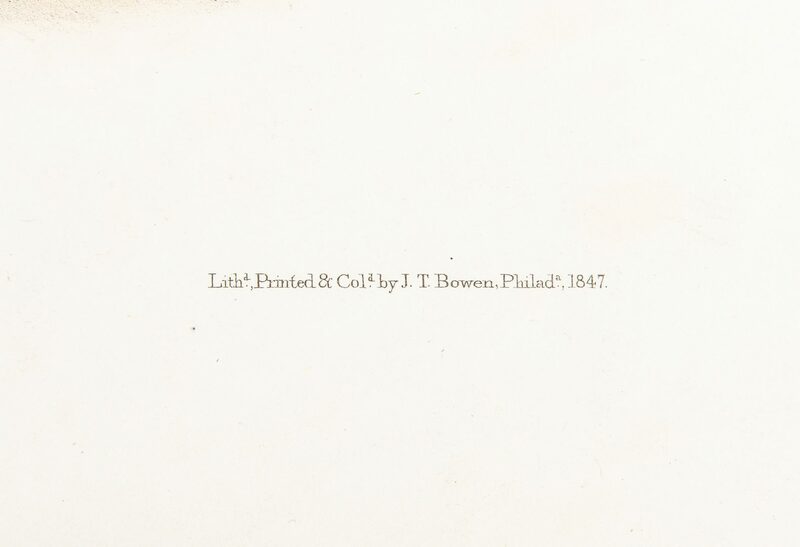 8, Pl. 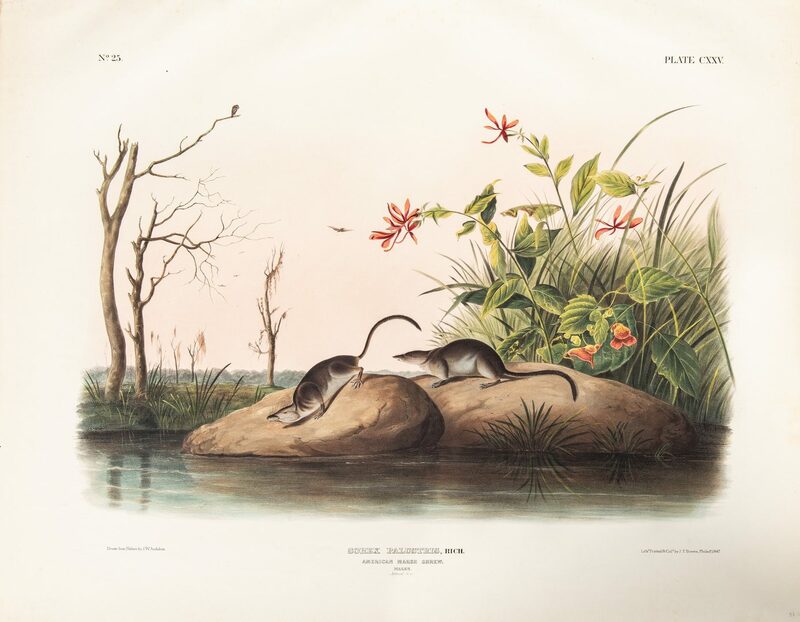 XL, White Footed Mouse", "No. 8, Pl. XXXIX, Leopard Spermophile", "No. 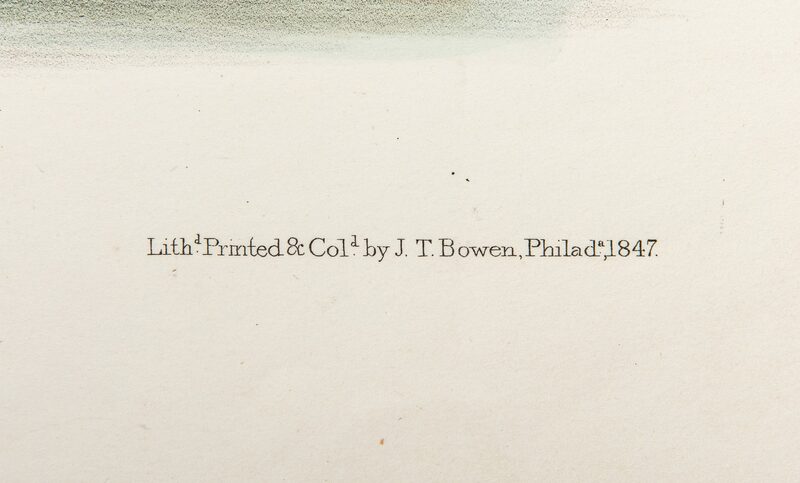 8, Pl. 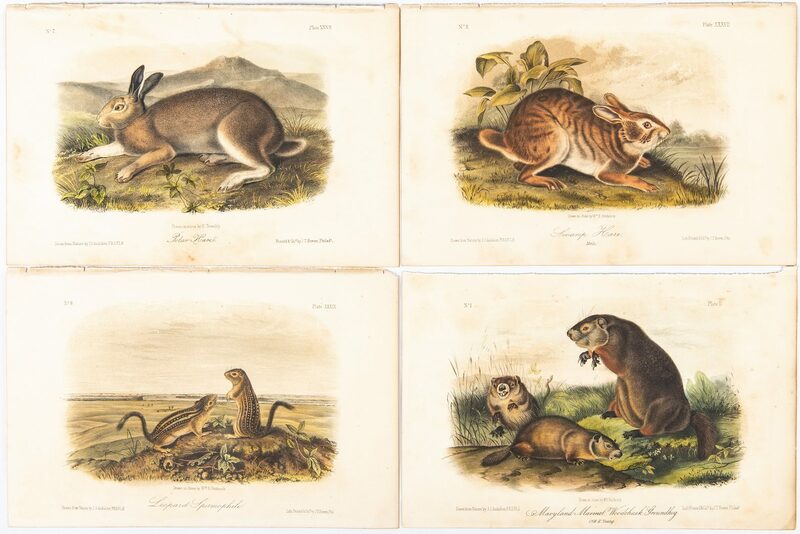 XXXVII, Swamp Hare", "No. 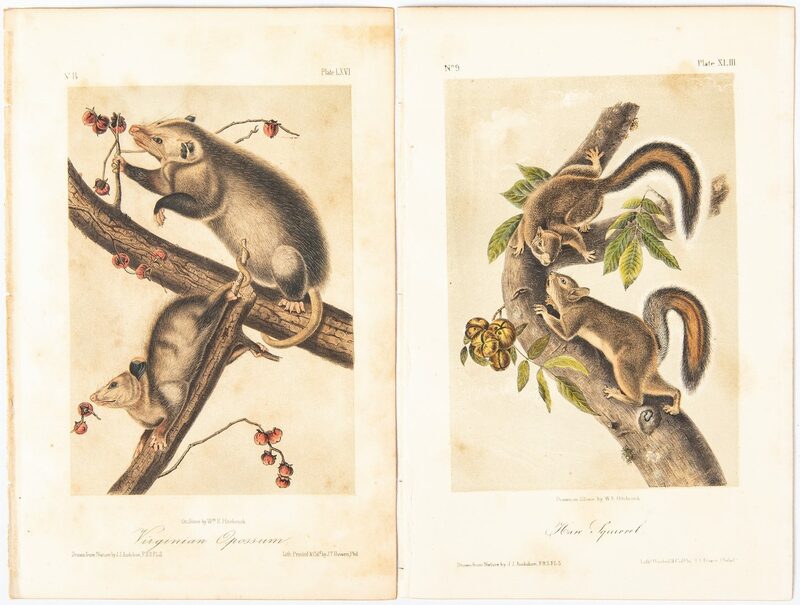 9, Pl XLIII, Hare Squirrel", "No. 10, Pl. 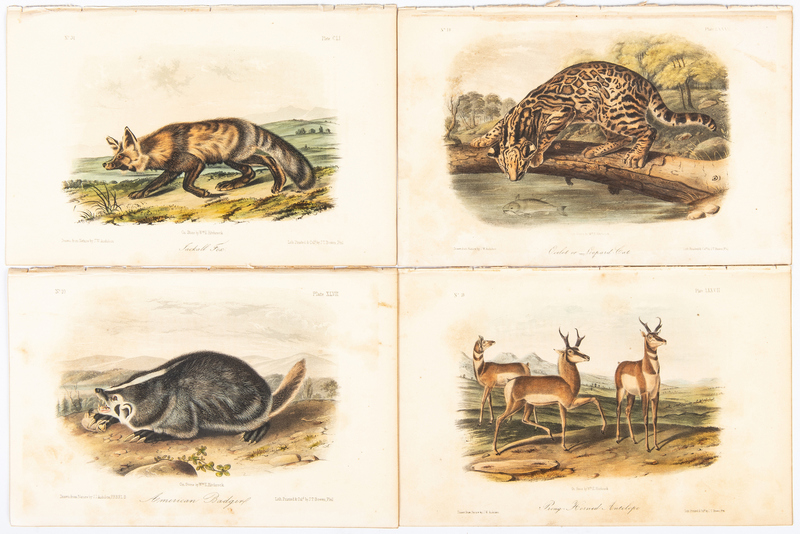 XLVII, American Badger", "No. 14, Pl. LXVI, Virginian Opossum", "No. 16, Pl. LXXVII, Prong-Horned Antelope", "No. 18, Pl. 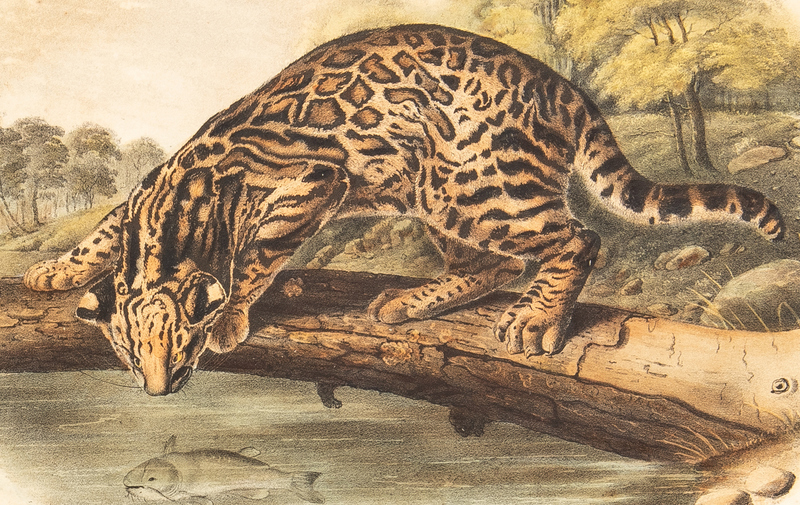 LXXXVI, Ocelot or Leopard-Cat", "No. 18, Pl. LXXXIX, Say's Squirrel", "No. 28, Pl. 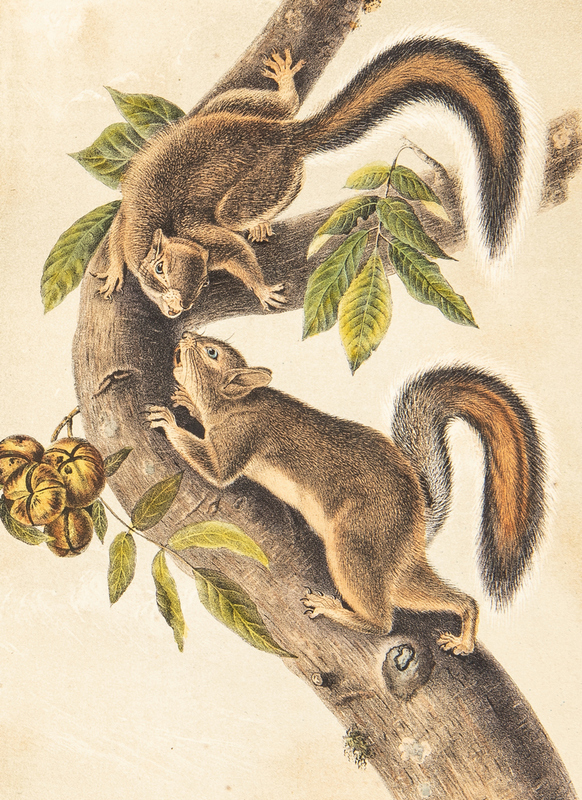 CXXXIX, Large-tailed Spermophile", "No. 30, Pl. CXLVII, American Souslik, Oregon Meadow Mouse, Texan Meadow Mouse", and "No. 31, Pl. CLI, Jackall Fox". 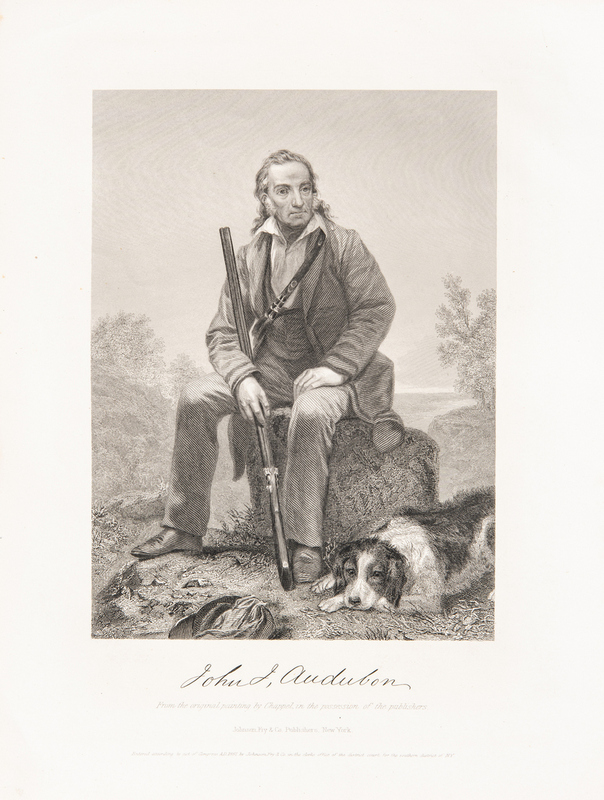 Prints approximately 7 1/8" H x 10 3/4" W. 21st item: Steel plate engraving of John James Audubon after the painting by Alonzo Chappel (New York, 1828-1887), published by Johnson, Fry and Company, New York, 1861. From "National Portrait Gallery of Eminent Americans" by Evert A. Duyckinck. Depict Audubon seated in a landscape setting, holding a rifle with a dog laying by his feet. 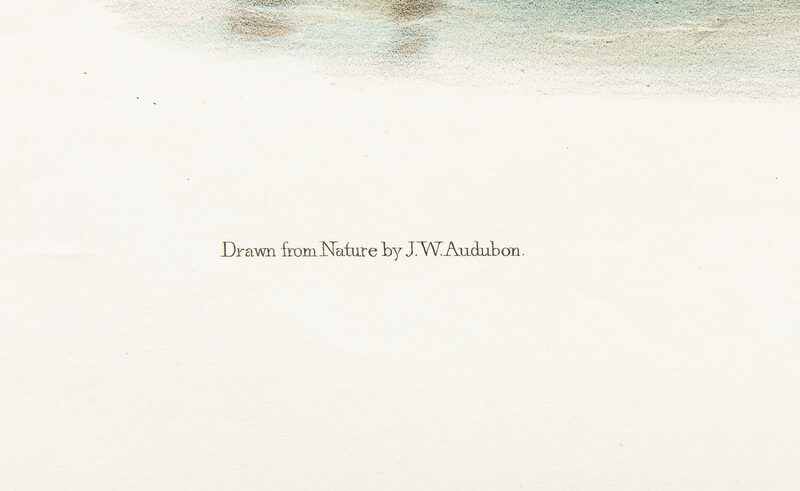 Fasimile of Audubon's signature, centered below image. 10 7/8" H x 8 1/4" W. American, mid 19th century. 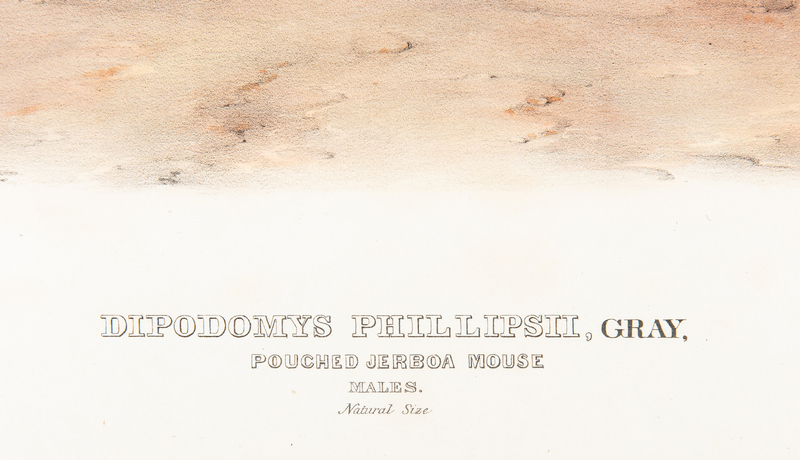 CONDITION: 1st-2nd items: Overall good condition with foxing spots, toning, and pencil inscriptions. Old tape residue, across top width of "No. 25". 3rd-20th items: Overall good condition with toning, foxing spots, and areas of dampstaining. 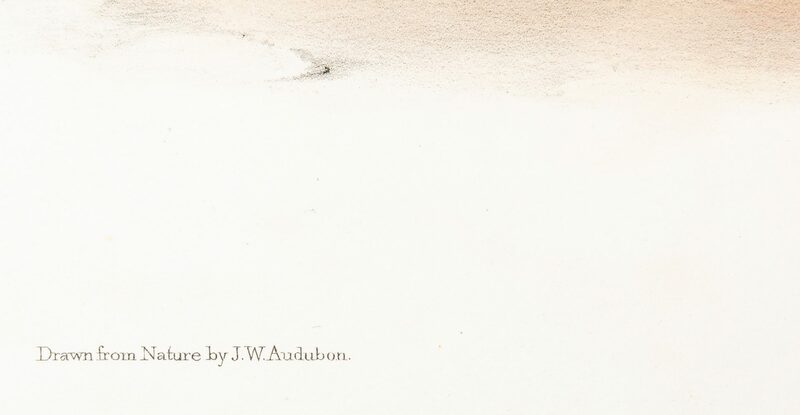 Toning impressions from text pages, en verso. 21st item: Overall good condition with few foxing spots. Scuffs, en verso.